Written by David Smolker on November 14, 2018 . Posted in Capellaspace, Earth Observation, Sar, Satellite Technology. SAN FRANCISCO — September 26, 2018 — Capella Space, an aerospace and information services company providing on-demand Earth observation data via advanced space radar, announces $19 million Series B funding led by Spark Capital and DCVC (Data Collective) and joined by Mark VC and Harmony Partners among other investors. This will finance the first operational launches of the company’s cloud-penetrating, radar-powered small satellites, designed to deliver high-quality imaging anywhere and under any condition, day or night. 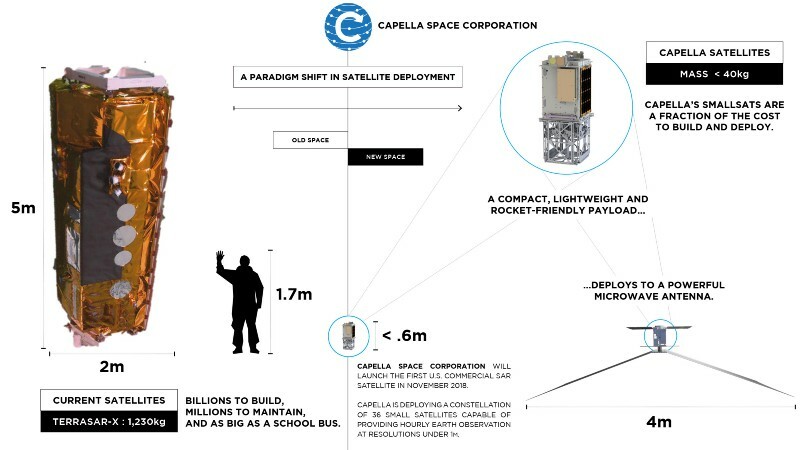 In an unprecedented engineering feat, Capella’s satellite, the size of a backpack on launch, combines an origami-like antenna that unfolds to almost 100 square feet with radically efficient electronics that together deliver effectively the same image quality as radar satellites the size of a school bus. The first Capella test satellite launch is scheduled for November 2018 ahead of next year’s first operational launches of a planned 36-satellite constellation that will deliver reliable images from anywhere on the planet in under an hour.